FirstOntario Performing Arts Centre incorporates masonry in a variety of unique ways. In total, nearly 110,000 CMU and 60,000 brick were used in the construction, including the walls surrounding the recital and concert halls. 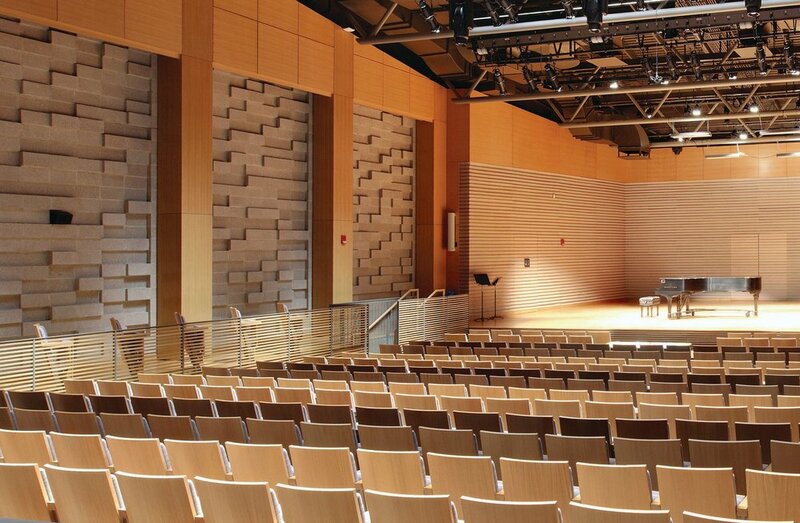 In addition to serving as structural backup, these walls were designed specifically to enhance acoustic performance in the performance halls. CMU easily met the goals of sound isolation and reflectance. Clever unit design and placement met the diffusion goal in a cost-efficient manner. Designed by the acoustic consultant, custom CMU of varying widths for even sound diffusion were specified and locally produced. While unit placement appears to have a random arrangement, the wall was designed and laid out in advance for optimal acoustic performance. Masons worked from drawings to determine where to place each 190mm, 240mm or 290mm wide unit. Each of the three sizes maintained a consistent, continuous cell column to accommodate the vertically-spanning steel reinforcement. The two wider units were produced with smaller, offset cells to line up with those of the 190mm units. The use of variable width CMU walls of varying thicknesses serves three purposes. First, CMU walls provide mass to help isolate the space from outside noise as well as the adjacent theatre. Next, the density and smooth surfaces allow sound to be reflected, not absorbed. Finally, the arrangement of the varying widths ensures that sound is diffused or evenly spread around the theatre in such a way that there are no hot or dead areas. Regular CMU backup walls with added pre-manufactured acoustic panels were alternatively considered. The cost of the system combined with the fact that the CMU walls alone already accomplished two of the three acoustic goals led the design team to find a way to use CMU to also meet the third goal. Varying the widths provided the solution and added a playful flair to the overall aesthetic. Novel use of structural cmu taking advantages of masonry’s superior acoustical properties. Nicely executed, reaching an aesthetic and functional goal simultaneously. The common cell location with the varying block widths enhance acoustic, the fact that the CMU is structural and simultaneously aesthetic, and that the use of the CMU is technically informed make this one of the hardest working CMU jobs I have ever seen. Ground face units are beautiful.